August was HOT. The temps in Seattle were much higher, on average, than usual. As a consequence of these norms, the city doesn’t believe in air conditioning…so Tom and I were on the lookout for any solution to cool down. In many parts of the world, heat is met with more heat. Whether it is an Indian drinking hot chai or a Jamaican enjoying jerk chicken (seasoned with must-have Scotch bonnets), a variety of cultures turn to hot and spicy foods in the sweltering heat. The reason? It makes you sweat, and sweat cools you down. I’m no scientist, but we were desperate and willing to try anything. So we decided to indulge in our own spicy experiment with Pad Kee Mao. Our small gang of backpackers had convened at a grass hut guest house the night before, the entire village having lost power at 7PM (daily occurrence) we’d bonded over candlelit noodles and communist beer (Beerlao), and planned the following day’s excursion. Tham Kong Lo is a stalactite-riddled mega cave that stretches deep underneath miles of limestone karst, home to a singular, somewhat terrifying ecosystem and traversable only by canoe. There’s darkness in familiar settings and then there’s pics, oily darkness pregnant with bats, giant spiders and dripping with humidity. 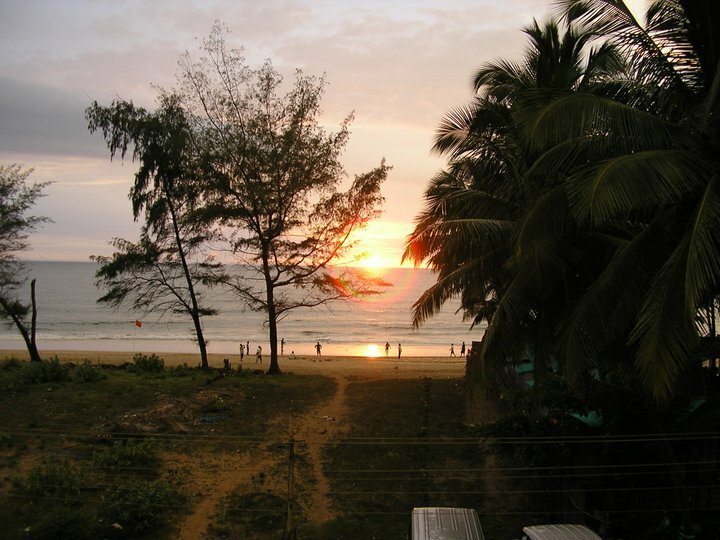 Everyone should experience the latter at some point, if only for the experience of emerging renewed and soaking wet into a lush jungle valley at the other side, sunshine streaming through the banyan trees. When Tom shared this story with me, I was inspired to recreate an image of those “stalactites” using our noodles…it was one of those things that sounded way cooler in my head. But the photo also illustrates perfectly al dente rice noodles, so I kept it. Moving on, many of us know Pad Kee Mao by it’s English title: Drunken Noodles. 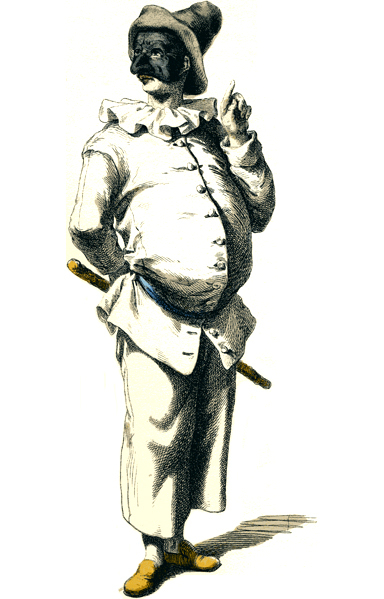 Khi mao is Thai for “drunkard”…yet the source of this appellation is a bit of a mystery. Some believe the first-ever recipe included rice wine, while others attribute the recipe to a drunken chef who concocted the dish with whatever was available in his home after a long night out. Regardless, it is now one of the cuisine’s most famous celebrities, and for good reason. The dish is spicy, but can be moderated to your taste by de-seeding the peppers or omitting them entirely. It brings together a variety of rich flavors in a fairly quick preparation: oyster sauce, chili paste, soy sauce, fish sauce, and loads of veggies. Tom cooks the dish so that there is very little liquid left in the pan before serving – so there is some patience involved. But the end result is absolutely worth the wait. 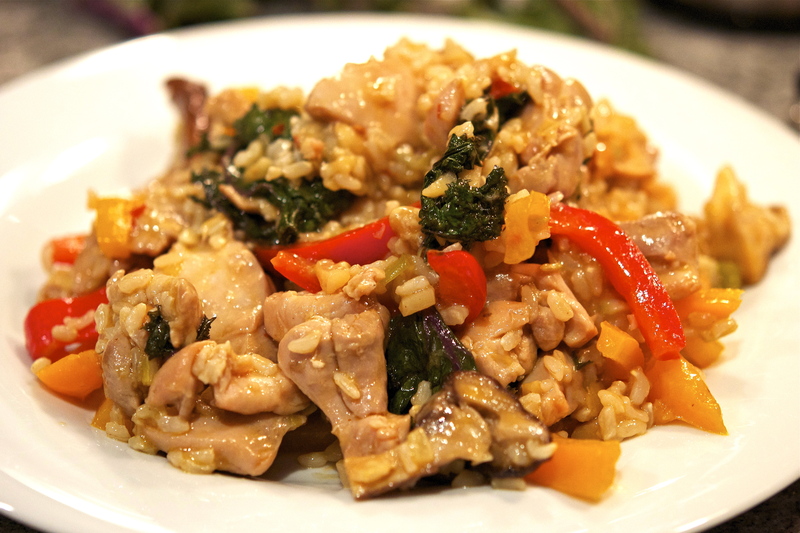 You can include one or a medley of proteins (we used both chicken and tofu in our recipe). One key ingredient, flavor-wise and aesthetically, is basil: you can use Thai or regular, just be sure to have a whole heap of it. 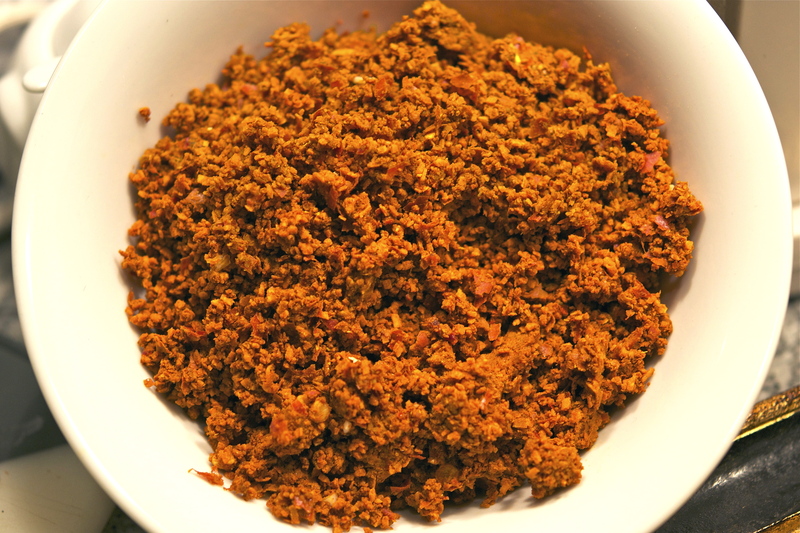 Click HERE to see the recipe for this spicy dish. When you eat something spicy, not only do you sweat – your heart rate also increases…much like my own whenever I think of playing the opening lines of Jacques Ibert’s Flute Concerto. Written in the doldrums of the Great Depression, the work was commissioned by the renowned flutist and pedagogue Marcel Moyse. It is surprisingly lighthearted for the era yet far from frivolous. Even with a reduced orchestra, the work is both both elegant and rich with thematic color…and, for the soloist, very difficult to perform. The opening stanza is an audition ace, as flutists across the world harness the dramatic statement to impress panels. The piece as a whole sustains an exhilarating pace, with two poignant respites that allow our soloist to catch her breath…just before hurling the audience into an electric finale. The following recording features Emmanuel Pahud (my flute hero) and the Tonhalle Orchester Zürich performing the first movement of the concerto. Enjoy! After a crazy 11 months of nonstop action and studying, my first year as an MBA student is officially done! It was an extraordinary year, and I’ve learned a great deal about both business and myself. I’ll be starting my internship at Colgate-Palmolive very soon, but in the meantime thought I could catch up on blogging about my culinary adventures in my little corner of Brooklyn. Tom and I have been cooking a great deal, but between term papers and B-school life I was hard pressed to find the energy for taking photos. We decided celebrate the end of finals by cooking Pork Tenderloin with Thai Spices and Peanut Sauce. Thanks to some Thai classics such as lemongrass, ginger and lime, the chicken could have stood on its own. The marinade is essentially a puree of aromatics that then translates to a beautiful coating in the final product. 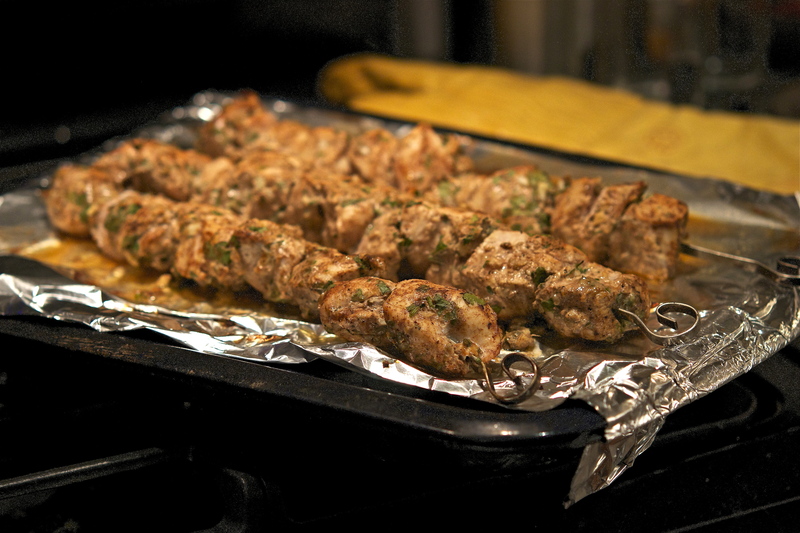 The original recipe calls for skewers (to make an actual “satay”) but I just thinly sliced the pork and arranged them on a baking tray – for ease of a quick weeknight meal. I imagine chicken could be an apt substitute, but I highly recommend the tenderloin. Add in the rich peanut sauce and cucumber relish, and you’ve got yourself an incredible meal. The peanut sauce was perhaps my favorite. The coconut milk and sesame pair beautifully with the chicken, and the texture can be adjusted to taste (smooth like butter, or a rougher blend for added crunch). The salsa, while simple, was a phenomenal addition. I cut back the sugar in both the peanut sauce and the salsa, but you are welcome to add more (or less!) to taste. I made the sauce the night before, which definitely enhanced the flavors, and the cucumber salsa while the pork was cooking. Overall, this was a fantastic meal and one that we’ll be making again. Click HERE for this fantastic recipe! As was standard for works of the time, the symphony consists of 4 movements. However, its architecture was audacious – defying the norms of the “sonata-like” form that so many composers had followed before. That being said, the turn of the century was ushering in a new era of symphonies, with composers such as Mahler and Wagner having disrupted the scene decades prior. Yet what made this symphony unique was its ability to capture the hearts of audiences from the outset. The pastoral opening flows through a series of personalities, taking the listener on an impassioned journey of climactic highs and dulcet lows. In a word, this piece is eternal – having stood the test of time. The following video features Leonard Bernstein and the Vienna Philharmonic, performing the symphony in its entirety – enjoy! Everyone has their special recipe – grandma’s marinara, a secret chocolate chip cookie recipe, dad’s favorite BBQ sauce. 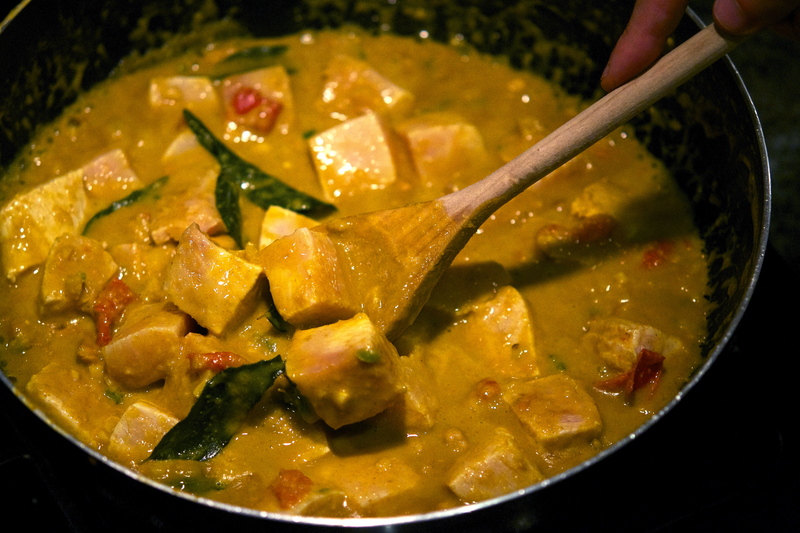 For Tom, his recipe is this beautiful Mangalorean Curry. 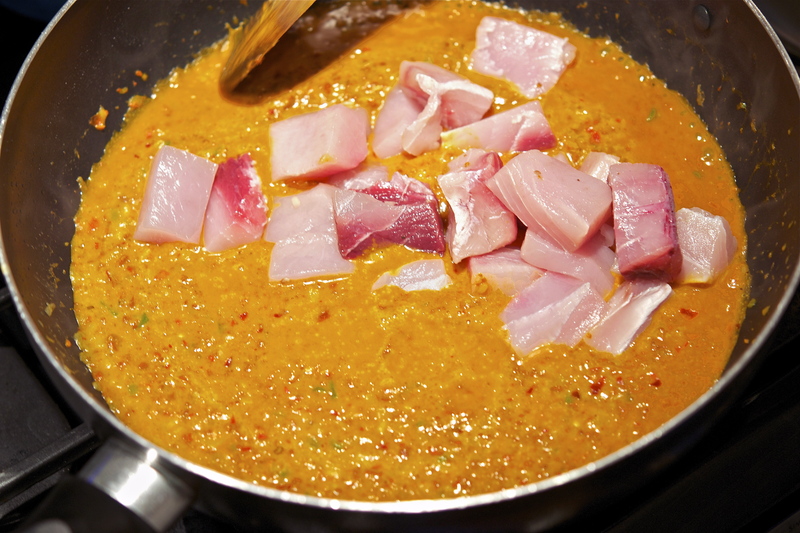 Chunks of swordfish are slowly cooked in a curry sauce that will knock your socks off. He’s made this for me several times, and I’ve been dying to feature it on the South of the Orient Series. This is a dish that he has updated and perfected over the years, making it absolutely perfect for special occasions. 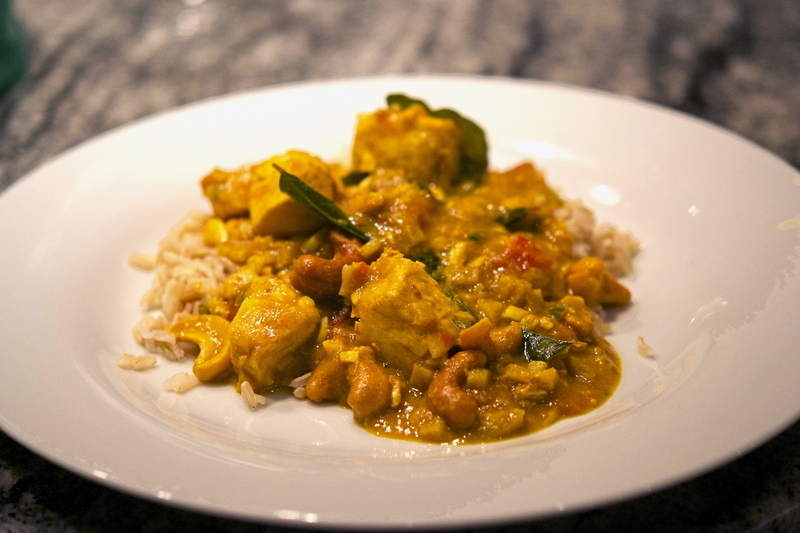 A word of warning: this may become your new favorite curry…in fact, I can guarantee it. The base of this curry is a fragrant paste of chilies, aromatics and seasonings, all of which give the curry its unparalleled flavor and gorgeous hue. As I mention above, this curry packs a punch: two types of chilies and a healthy dose of spices take this recipe the extra mile, but air on the side of caution for those who can’t take the heat. For those who can, I promise this is curry for you. 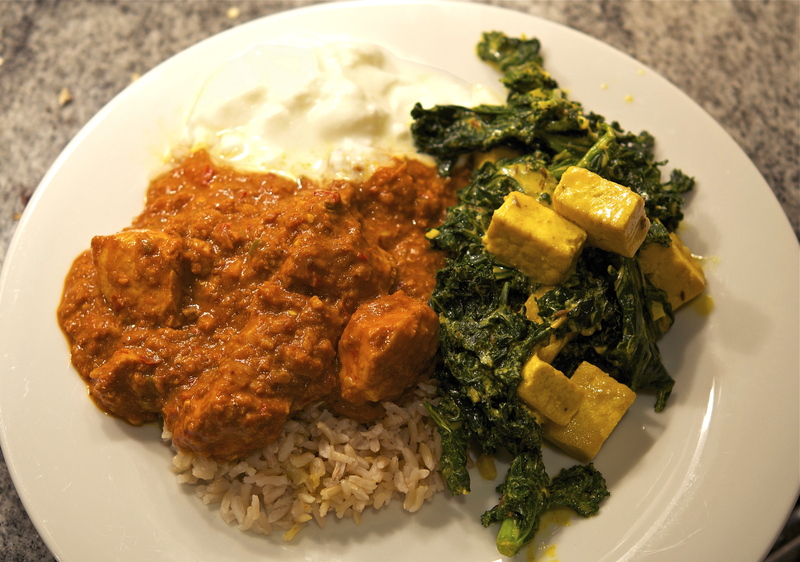 We enjoyed the curry with a side of our favorite Saag Paneer (using kale in lieu of spinach) and a dollop of yogurt, since Tom made this particular batch a little spicier than we were used to. Needless to say, it is a beautiful dish and fantastic way to impress any guest. What is truly remarkable about a favorite recipe is that it feels like home, no matter where you are or who you are with – why else do you think I am so in love with cooking? Click HERE to see the recipe for this fantastic dish. This recipe’s complexity and storied introduction make it a special one, deserving of a piece that is both notable and unique. The curry is an homage to generational traditions, while also being the signature of Tom’s own style and culinary craft. So for this particular pairing, I chose Osvaldo Golijov’s Oceana, for Vocalist, Boy Soprano, Chorus and Orchestra. Composed in 1996, the work was a commission for the Oregon Bach Festival’s “Cantatas of the Amercas” concert series. The festival was seeking to premiere new works that pay tribute to the genius of Johann Sebastian Bach – THE father of cantata writing – while also establishing a voice in this new day and age. Golijov’s work also draws musical inspiration from his native Argentina and Chilean poet Pablo Neruda. Oceano consists of seven movements, alternating between passionate choral refrains and pensive interludes. The score calls for a “Brazilian jazz-style vocalist,” a boy soprano, two choirs, two guitarists, and an orchestra consisting of a piccolo, three flutes, alto flute, percussion, and strings. This recipe’s complexity and storied introduction make it a special one, deserving of a piece that is both notable and unique. This curry is an homage to generations of cooking tradition, while also being the signature of Tom’s own style and culinary craft. So for this particular pairing, I chose Osvaldo Golijov’s Oceana, for Vocalist, Boy Soprano, Chorus and Orchestra. 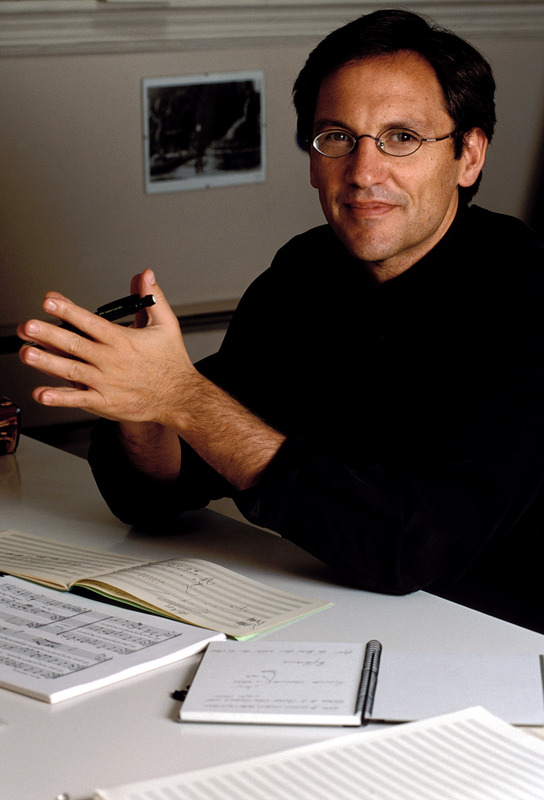 Composed in 1996, the work was a commission for the Oregon Bach Festival’s “Cantatas of the Amercas” concert series. The festival was seeking to premiere new works that paid tribute to the genius of Johann Sebastian Bach – THE father of cantata writing – while also illustrating a contemporary voice. Golijov’s work draws musical inspiration from his native Argentina and Chilean poet Pablo Neruda. Oceana consists of seven movements, alternating between passionate choral refrains and pensive interludes. The score calls for a “Brazilian jazz-style vocalist,” a boy soprano, two choirs, two guitarists, and an orchestra consisting of a piccolo, three flutes, alto flute, percussion, and strings. The following video features the first movement of the piece (the remaining movements can easily be found on YouTube) – enjoy! Before I met Tom, I was fairly certain that Indian food was one cuisine that could never be genuinely replicated at home. 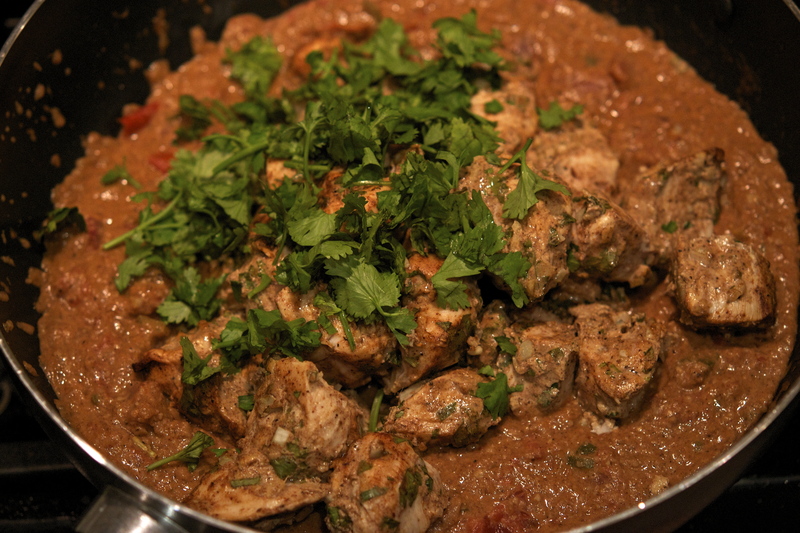 I have since enjoyed countless dinners of remarkable Indian dishes packed with flavor, hailing from a variety of regions. This compelled me to launch the South of the Orient series on my blog, with the hope of sharing the diverse and colorful recipes we have been enjoying. One that has become a standard is Fish Molee: a dish that is as unique as it is delicious, and is quite simple to make. The above photo comes from Tom’s travels to Southwest India – it captures a unique contraption of fishing nets located along the shore of Kerala. It is an ancient mechanism from which square nets are suspended over the water by large wooden beams, balanced and controlled by stone counterweights on the shore side. It can take up to 6 fishermen to operate a single net. 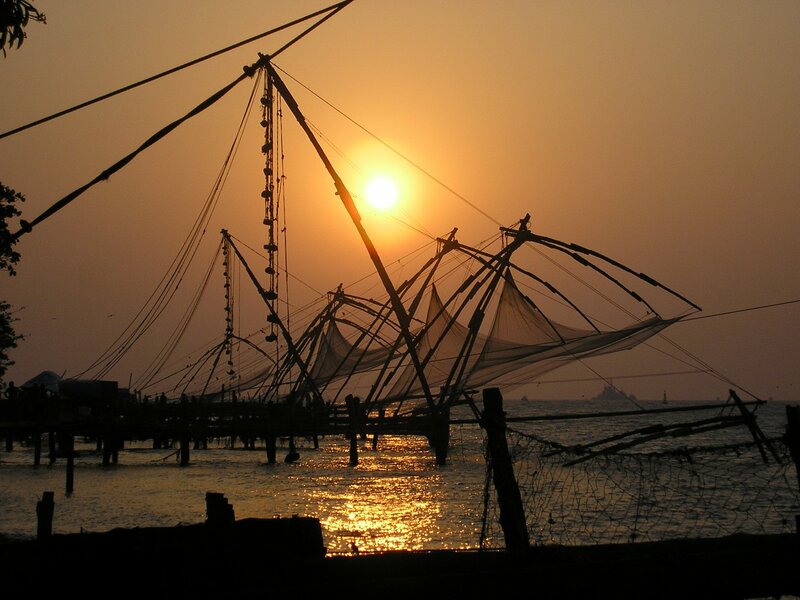 These nets are just one example of the regional beauty found in Kerala. 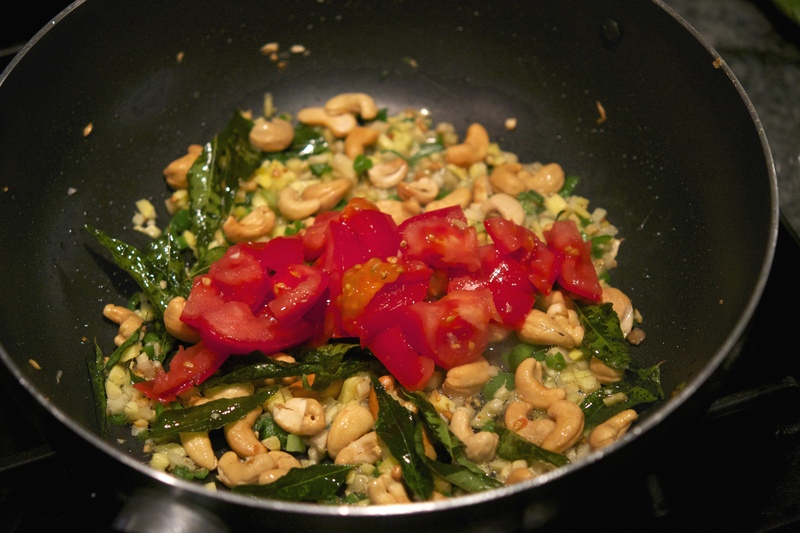 My favorite part of this dish is the cashews – they provide a unique texture to the dish, lending a hearty crunch with every bite. 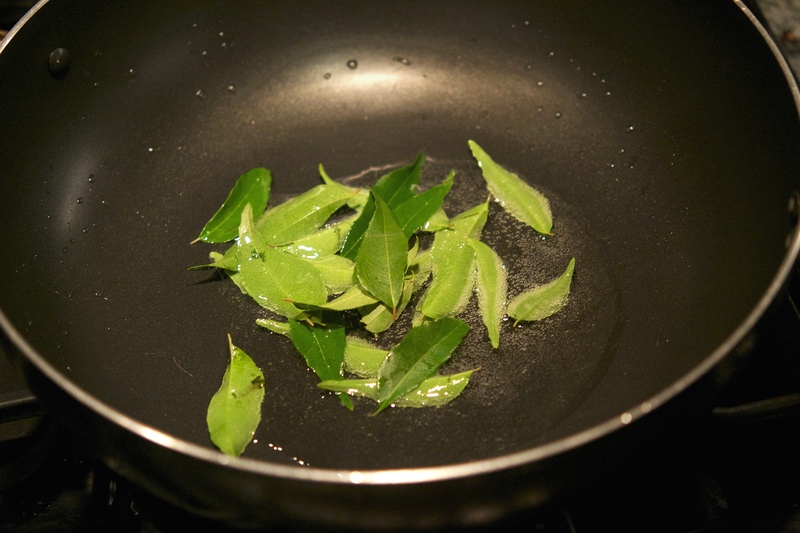 This dish also calls for curry leaves – a popular “curry” seasoning – which are similar to bay leaves in that they are purely intended to add flavor (in other words, don’t eat them). The consistency of the sauce comes from the coconut milk, ground almonds, and onion puree. 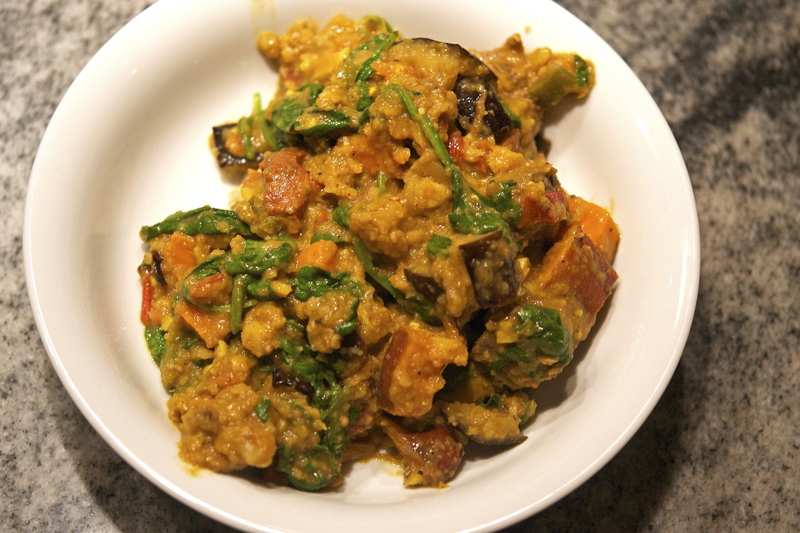 Overall it is packed with nutrients and flavor, and has become the go-to Indian curry for both of us. Click HERE to see the recipe for this unique dish! The ballet was premiered for a Parisian audience in May 1920. 2 years later, Stravinsky abridged the ballet into a “Suite” for chamber orchestra, which uses 11 of the original 18 movements – the work has since become a standard of the orchestral canon. Like the above dish, Pulcinella is by far one of my favorites – the colors and characters are truly unparalleled, and I hope you enjoy it! What a crazy, wonderful, insane summer it’s been! I visited Canada for the first time, went backpacking through the White Mountains, cycled who knows how many miles, and cooked a ridiculous amount of food…which I’ve been terribly remiss in sharing on this blog. Blame the summer weather, but I’ve hardly had a moment to compose (much less edit) photos and text. I’ve documented a TON of creations over the summer, filing them away with a goal of having them posted at some point in the future…so I’m finally back at it with Lamb Dhansak in continuation of the South of the Orient Series, featuring my boyfriend’s amazing recipes (influenced by his travels in Southeast Asia). Dhansak is of Parsi origin, with influences from both Persian and Gujarati cuisine. The name itself is from the state of Gujarat (in west India), where dhan stands for “grain” and sak for “stewed vegetables”. The dish has a place in Parsi tradition, often served in honor of a loved one’s passing. Parsi households will abstain from eating meat for three whole days following the death of a family member. On the fourth day, this “fast” is commonly ended with a meal of dhansak. 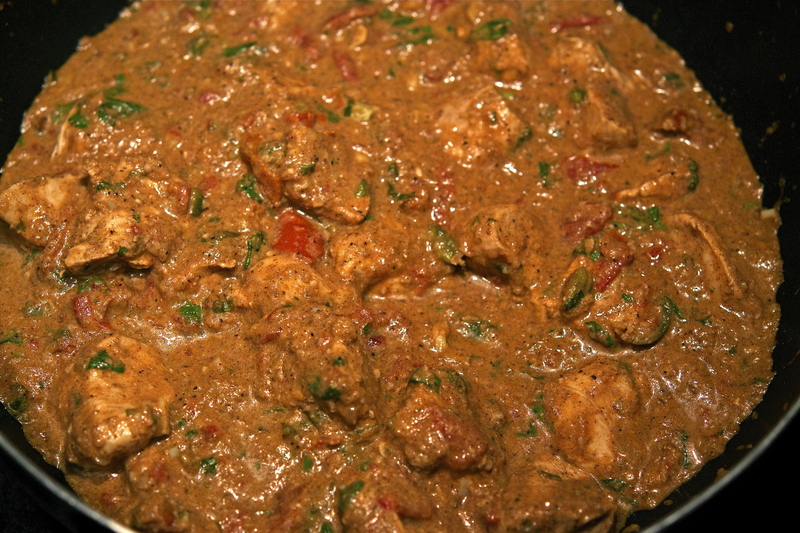 Traditionally made with goat or mutton, Parsi households will often modify the ingredients to merit the dish’s enjoyment year-round. This dish was intense – lots of flavor, tons of ingredients, and hearty to boot. You can omit the lamb if you’re seeking a vegan-friendly option, just be sure to use another filler in its stead. My favorite part of the recipe is the use of roasted vegetables. It’s a first (for me) in Indian cuisine, and works extremely well in the setting. 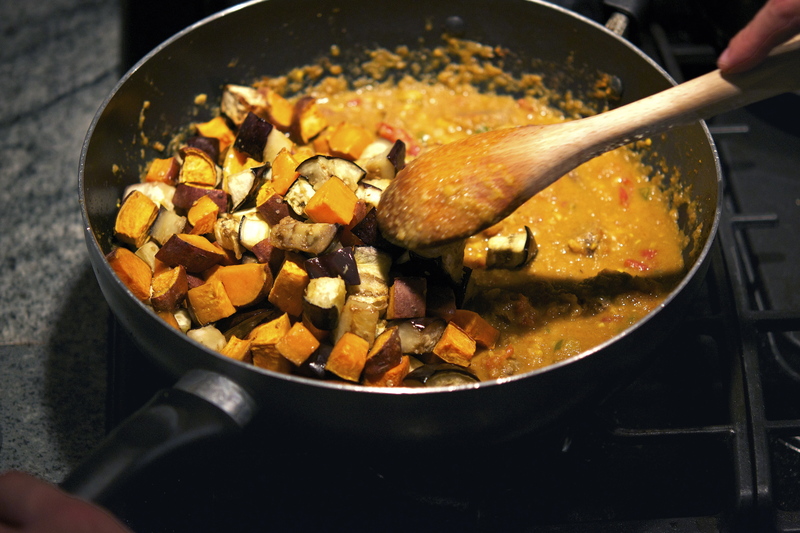 Spinach adds a shock of color, while the spices and lentils imbue the entire dish with a golden hue. Aside from being absolutely delicious, it is chock-full of nutrients and makes for great leftovers. Click HERE to see the recipe! While Dhansak is far from having ominous implications in the Parsi culture, it is rarely served around or during felicitous occasions. It thus seems appropriate to draw a connection to its tradition for the musical pairing. Death can be a powerful force in any context, to which classical music can lend a responsive and passionate voice. From Mozart’s Requiem to Barber’s Adagio for Strings, music often expresses that which words cannot. The emotional intensity provides an unspoken solace and understanding to the bereaved, whether or not the work was written with said intention. Such music is a reminder of life’s wonders and inexhaustible beauty. Both pieces are absolutely breathtaking – I hope you enjoy them as much as I do. For many, take-out Chinese is a beloved ritual: the sauce-laden dishes packed into decorative food buckets have become a movie night staple (in fact, I’m about to enjoy such an evening with my new roomie Megan!) Yet let’s be honest…it’s not the healthiest of cuisines. In fact, the nutritional detriments outweigh nearly all of the benefits. By no means does this mean you should forfeit your occasional Friday night movie and Chinese take-out tradition. But there’s a much healthier way to enjoy the cuisine for the rest of the week – give homemade a go! My boyfriend Tom loves to cook Chinese food, and his Kung Pao Chicken is possibly the best I’ve ever had (take-out included). Most of Tom’s recipes on this blog have highlighted the cuisines of Southeast Asia (under the aegis of South of the Orient series [hyperlink]), yet this is the first recipe of his that comes from the Orient proper. The dish – also known as Gong Bao or Kung Po – originated in the Sichuan Province of southwest China. It is named after Ding Baozhen: a governor of Sichuan during the Qing Dynasty. It is claimed to have been one of his favorite dishes, and was thus named in his legacy. However, its connection to an imperial official was later repudiated by radicals of the Cultural Revolution: a pro-communist movement from 1966 to 1976 that sought to eradicate cultural and capitalist traditions in China. The dish was therefore referred to as hong bao ji ding (“fast-fried chicken cubes”) or hu la ji ding (“chicken cubes with seared chiles”). The name Kung Pao was reinstated during China’s political reformation in the 1980’s. 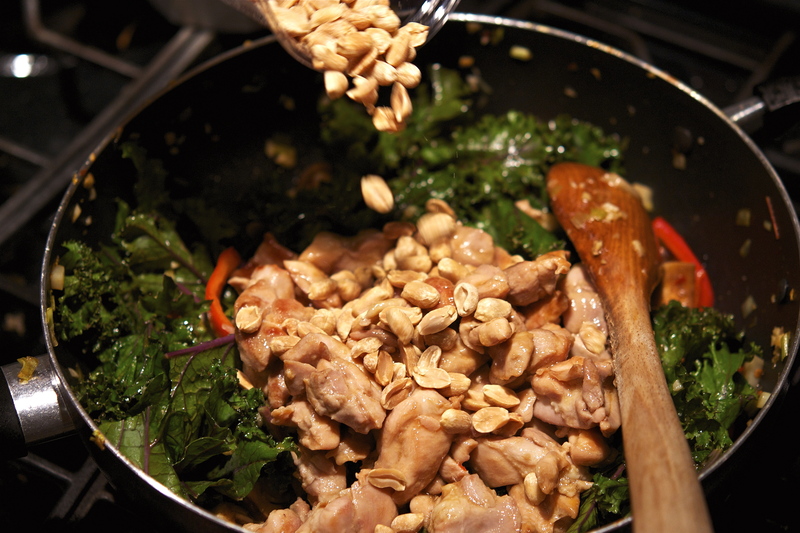 It’s a classic stir fry of chicken, peanuts, and vegetables, and is famously known for having a spicy kick. The traditional recipe contains Sichuan peppercorns (which I’ve blogged about before), but isn’t a necessary ingredient. 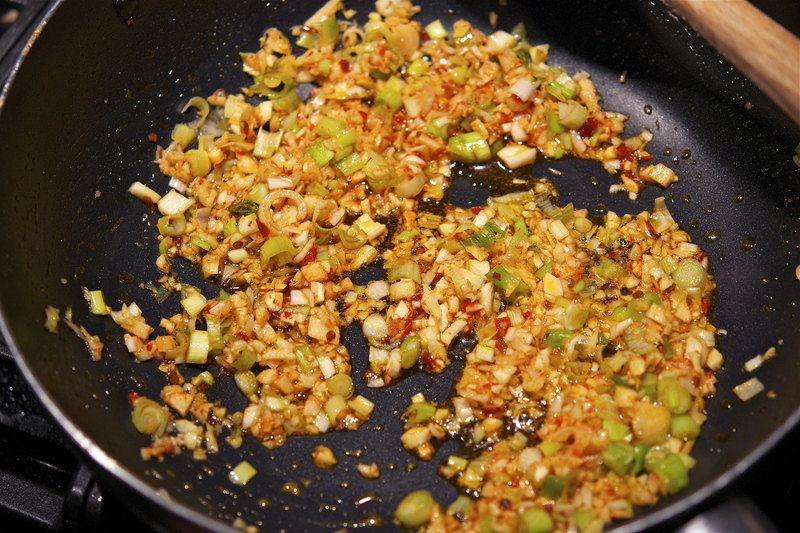 Tom’s version relies on Chinese chili paste, which is gently sauteed with a variety of minced aromatics. This step is where the magic happens – the rest will come from the sauces and ingredients, but these aromatics set up the base of this dish’s awesomeness. 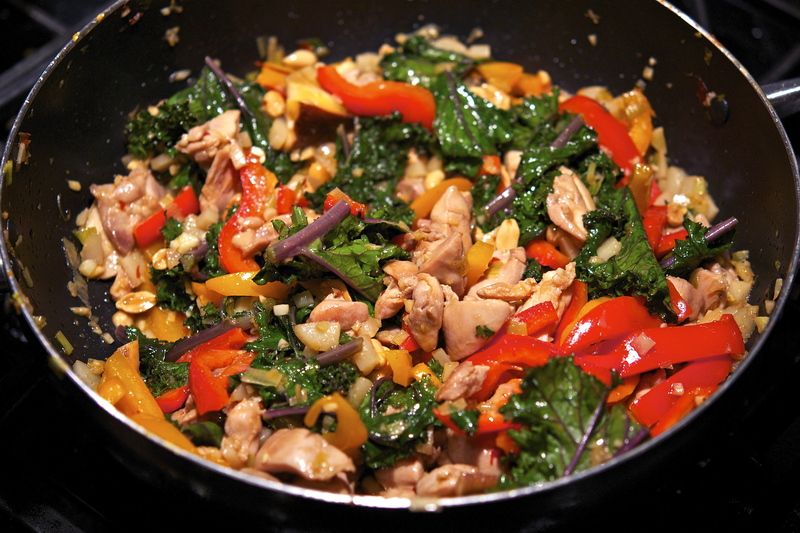 The best part about Tom’s take on this recipe is the copious incorporation of vegetables: we used a mixture of kale, bell peppers, and mushrooms. 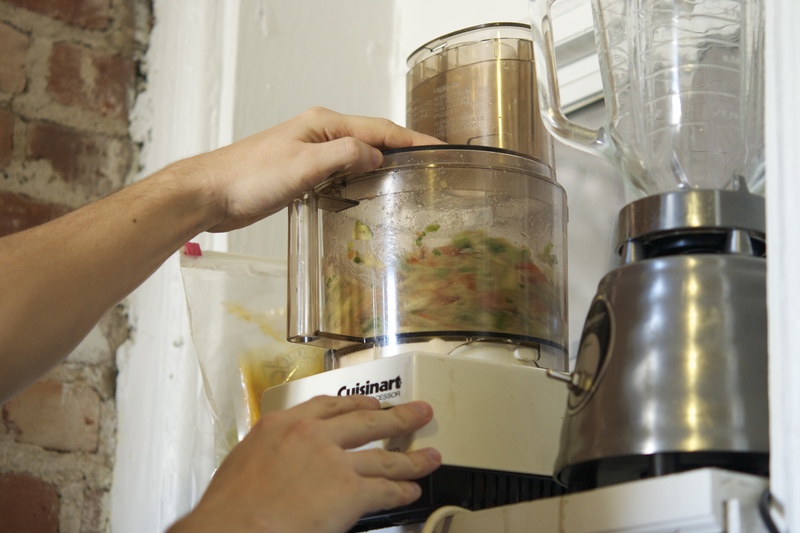 You can use whatever variety of vegetable you prefer, increasing or decreasing the amounts as needed. That being said, the two “add-ins” that should remain are the chicken and the peanuts (which really make the dish). The result is a meal that is both healthier, more colorful, and much tastier than take-out: click HERE to turn this classic into a homemade tradition! At the end of China’s cultural revolution mentioned above, the nation was longing to reawaken its artistic ambitions. The Central Conservatory in China reopened its doors in 1977, with the intention to accept no more than 100 students. 18 THOUSAND applications arrived, all of whom were desperate to pursue an art form they had been forced to abnegate for the past decade. The Conservatory accepted 200 students that year, with a number eventually joining the ranks of the internationally renowned musicians. One of the most notable graduates of that class was composer Tan Dun – his style is a unique fusion of Western, traditional Chinese, and experimental styles. In 1997, Tan Dun was commissioned to write a piece celebrating a truly historic moment for China: the return of Hong Kong to Chinese sovereignty from British rule. The work was premiered at the reunion ceremony (pictured right), titled “Heaven, Earth, Mankind – Symphony 1997”. The symphony is a large-scale work for solo cello, Bianzhong bells, a full orchestra, and children’s chorus. It is a celebration of the old, the present, and the future, paying tribute to the values of ancient China while looking forward to a new global community. The below videos are two excerpts from the work, titled “Jubilation,” and the “Song of Peace” (the videos are a little bizarre, but are the only two I could find on YouTube) – enjoy! Melvin, Sheila and Jinding Cai. “Composers Emerging From China’s Grim Revolution,” New York Times. April 1, 2001. A tradition that has become a recent obsession of mine is Sunday brunch – I am a fairly routine person in most cases, but sleeping in and indulging in a hearty “late breakfast” is about the best thing you can ask for at the end of a long week. Going out for brunch is a great, but cooking your own is even better. There is no need to wait for seating or to flag down the waiter every time you want coffee (which is every 8-10 minutes with me), and you can take as much time as your little heart desires. 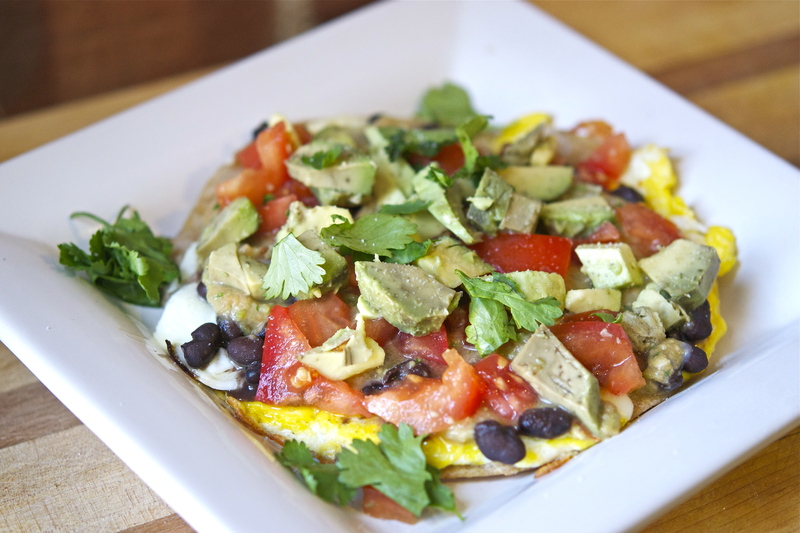 Tom took the reigns with a recent brunch, and made these heavenly Huevos Rancheros. This dish started out as basic late-morning fare for farmhands and staff (hence “rancheros”) – because it’s seriously delicious, the dish grew in popularity and quickly became a national (and eventually international) favorite. 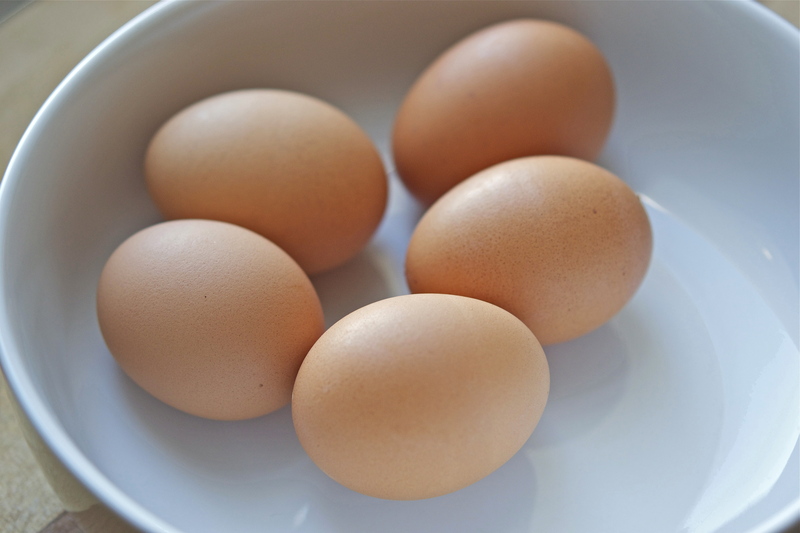 Eggs (“huevos”) play a central role to the dish. Tom and I are pretty picky when it comes to buying eggs, and always opt for the “free-range” or “organic” varieties. Regardless of your preference, I’d recommend getting high-quality eggs for this. The other key elements are the toppings: you’ve got salsa, tomatoes, beans, jalapenos – tasty goodness that results in every mouthful bursting with flavor. Tom loves that it’s high on protein, and I love pretty much anything smothered in salsa and avocado (except for cookies…that might be strange). 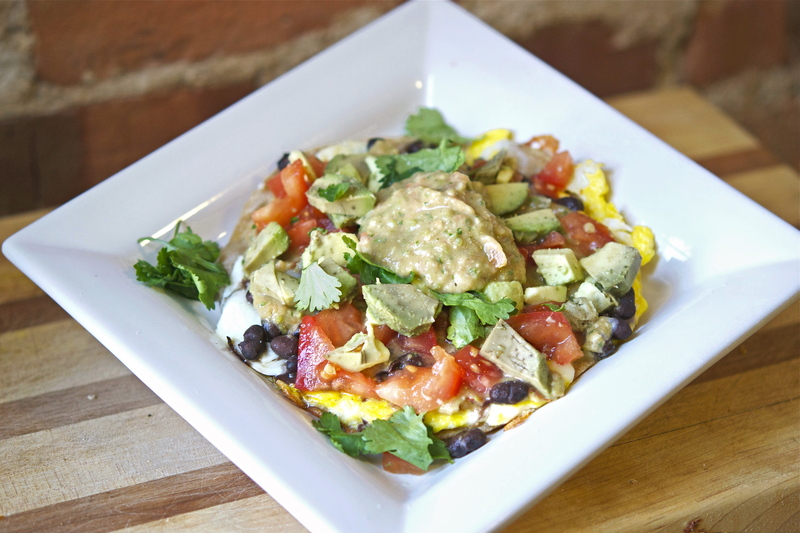 The process for making huevos rancheros is quite simple. You basically pan fry a variety of ingredients and make a quick avocado salsa…and voila! Breakfast crack – you can top it with cheese, cilantro, hot sauce, or even more cheese. Paired with a large mug of stovetop espresso and an episode Breaking Bad, this dish is the making of a beautiful brunch. If you’re a fan of Mexican food and not typically a morning person, consider this your new alarm clock: it is absolutely a reason to get out of bed, even on the coldest of days. Click HERE to see the recipe! Brunch is intended to be a deliberate indulgence (or marginally tipsy one if you go for the Bloody Mary/Mimosas). It’s the most casual meal you can have, and is often shared with someone you truly appreciate. Weekdays are made for being productive, active, and engaged – your weekend serves as a temporal “end” to the week’s craziness (unless you have to work on weekends…which is actually more common than you’d think in the non-profit realm). Regardless, brunch is your time to relax. When I was a little kid, my dad would always be playing recordings of classical or Spanish guitarists – music that’s often both beautiful and relaxing. Though this dish hails from Mexico, I was drawn to Spanish composer Joaquín Rodrigo for this post’s musical pairing. Perhaps his most famous work is Concierto de Aranjuez for classical guitar and orchestra. 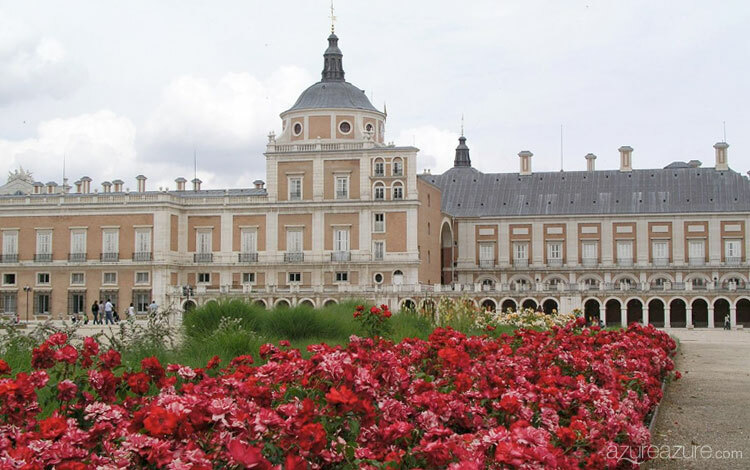 Written in three movements, the music takes inspiration from the gardens at Palacio Real de Aranjuez. Rodrigo himself said that every movement captures “the fragrance of magnolias, the singing of birds, and the gushing of fountains” of Aranjuez. The orchestra assumes a more temperate strength and gentle air in appreciating the guitar’s elegant voice. The second movement is perhaps the most well-known of the three, and speaks to the works more subtle beauty – jazz legend Miles Davis said about the Adagio: “That melody is so strong that the softer you play it, the stronger it gets, and the stronger you play it, the weaker it gets.” Other famous admirers of the piece include Led Zeppelin’s John Paul Jones, clarinetist Jean-Christian Michel, jazz pianist Chick Corea, American figure skater Michelle Kwan, jazz bassist Buster Williams (to name a few). The below recording features guitarist John Williams (NOT the film guy, but I’m sure he gets that a lot) at the BBC Proms – enjoy! There are days when I have the time and energy to make a meal that’s so gosh darn pretty it could be a model for Bon Appetìt. Last week was an especially long one, so I was pining for an extra-special treat (translation: “gourmet meal”) to take off the edge. Yet it was also a very cold week, so the prospect of venturing beyond the confines of my warm apartment was out of the question. 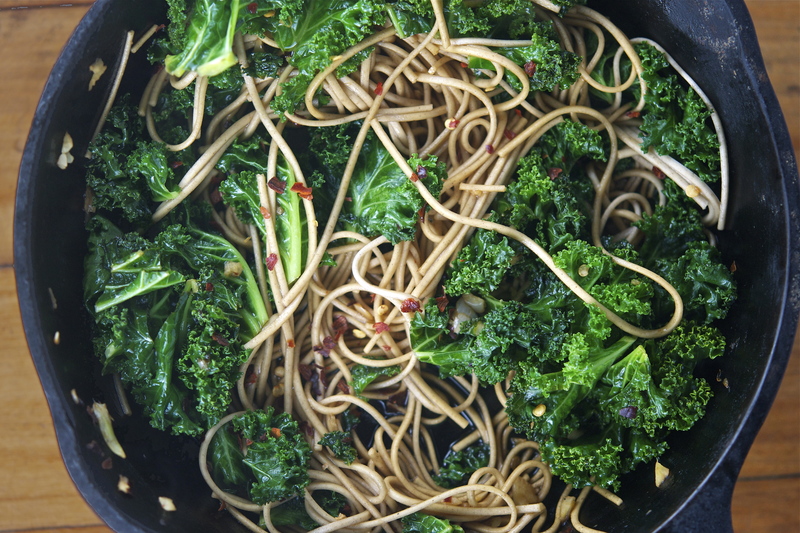 Looking through my fridge, I saw a crate of organic eggs and a bunch of curly kale. 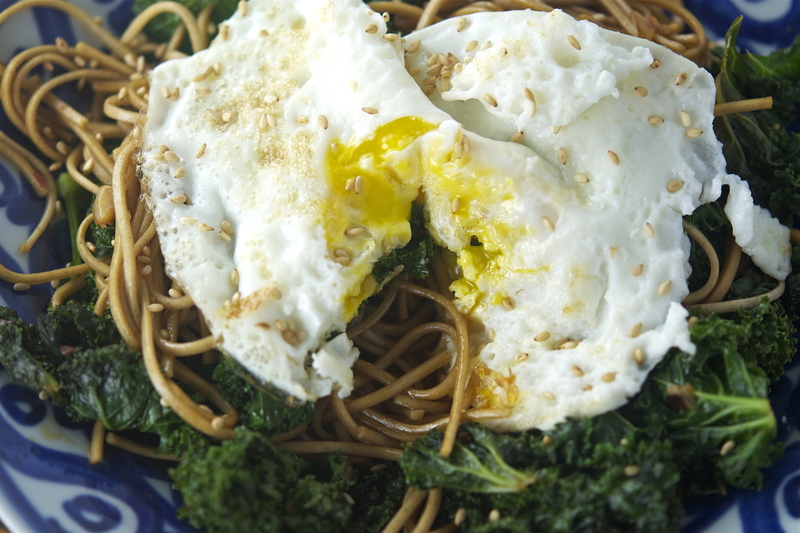 Pinterest was once again there to save the day, as it led me straight to a recipe for Sesame Soba Noodles with Fried Egg & Kale. Sesame is one of those ingredients that’s consistently awesome. 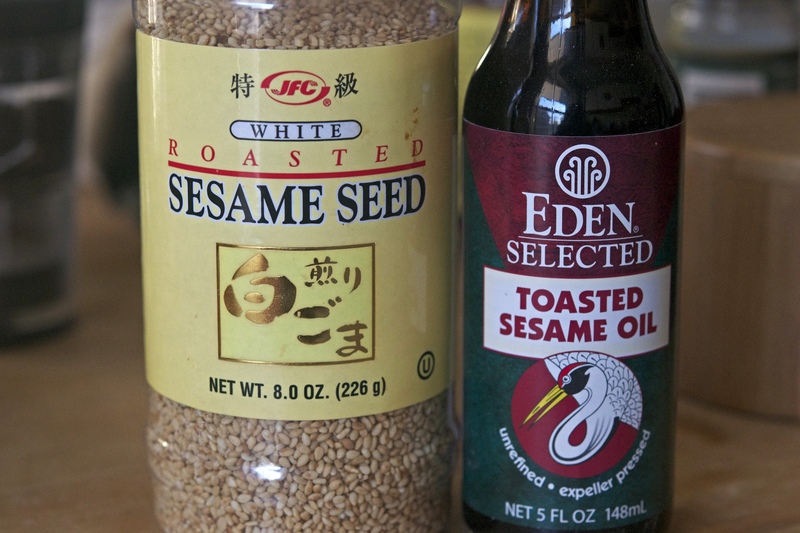 While many associate it as being an oil, sesame comes in a variety of contexts: whole seeds, sesame paste (better known as Tahini), sesame flours, etc. The seeds come from a flowering plant that thrives in tropical climates across the globe. It’s been a cultivated food source for over 3,000 years, and for good reason: its oil is loaded with antioxidants, Omega 6 fatty acids, and protein. It’s a staple in Asian and Middle Eastern cuisines. This recipe uses the oil AND seeds, so it a packs an extra-healthy punch. 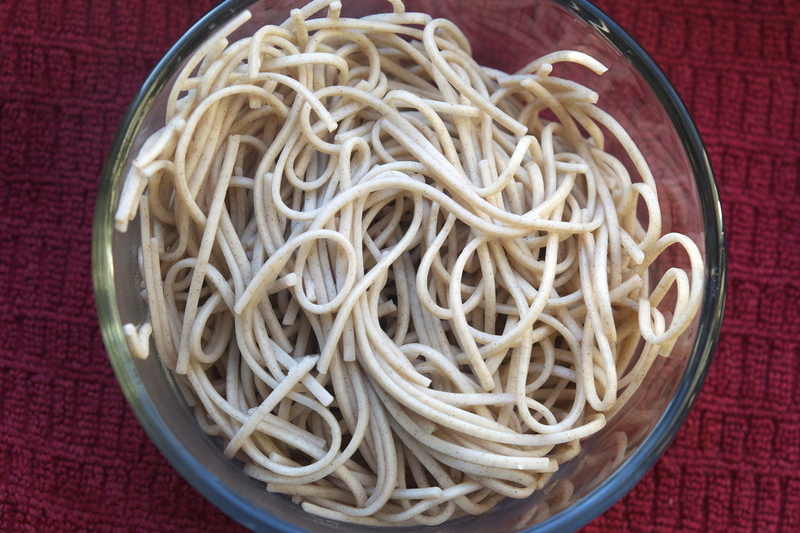 Soba is the other quintessential ingredient in this dish – a thin noodle made from buckwheat, it’s is a staple of Japanese cooking. The noodles are traditionally served cold with sides and toppings, or hot in a noodle soup with some variety of protein. It’s quite hearty, and can be prepared a day or two in advance (to save on cooking time). This particular recipe is an atypical setting for soba – its closest affiliation is perhaps to the dish Tsukimi soba (“moon-viewing soba”): a noodle soup topped with a raw egg, which cooks in broth upon serving. 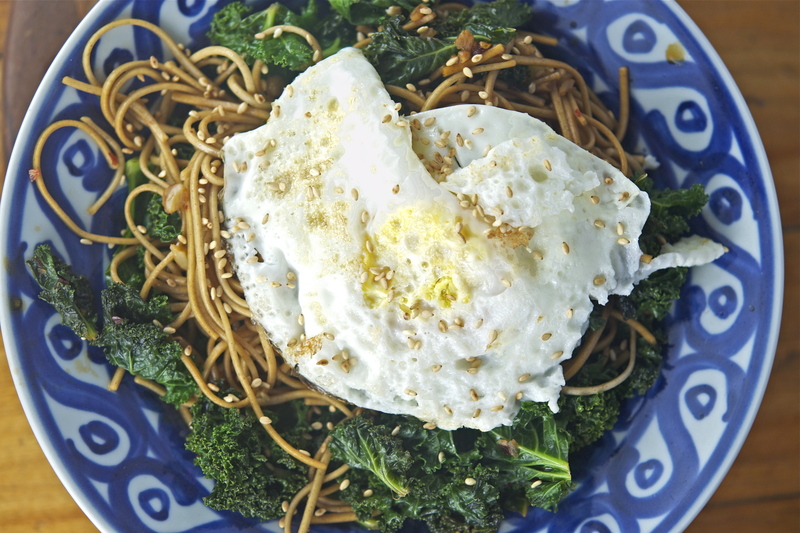 The variety of textures give this dish remarkable character: hearty soba noodles, crunchy sesame seeds, curly kale leaves, all topped with a creamy yolk. You can double or triple this recipe if you’re hosting for friends, but it’s a perfect meal for two (or even one). I made this meal two nights in a row. It’s perfect for a winter night with a glass of chardonnay. For those of you who are anxious about runny yolks, feel free to cook the egg all the way through – the dish will still be great. 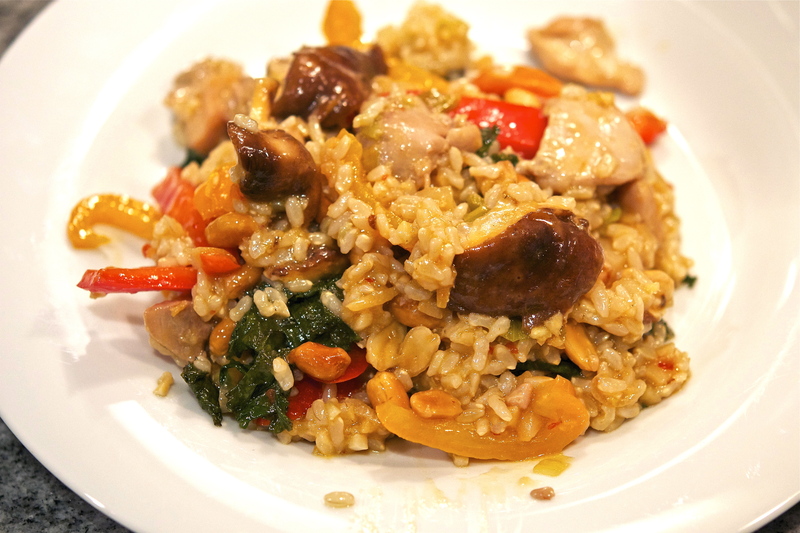 Click HERE to see the recipe for this quick weeknight meal! For those of us with busy lifestyles, every moment counts – so there is a lot to be said for the small indulgences we take. While I’d love to see myself in Ina Garten’s shoes (the woman’s kitchen is so big that it has its own house), my practical side understands the limits imposed by my current lifestyle. This recipe was perfect, as it allowed me to prep a killer meal in under 30 minutes! It is the simple pleasures that fuel happiness, from cultural previews to culinary tastes. Listening to a piece of music can set the mood for your entire day, and a piece that has been consistently rewarding for me is Leonard Bernstein’s Candide Overture. Written in 1956, the work is part of the operetta Candide. While the operetta had a modest run (closing after only 73 performances), the overture itself was an instant success. The 5-minute opening is filled with an excitement and passion that can bring any audience to its feet in applause. Typical of Bernstein’s music, the orchestration is phenomenal and the the themes are unforgettable. Given it’s short duration, it’s one of those pieces you can listen to just about any time of day – in fact, I think I’ll hit repeat once I’m done typing this blog. The below recording is with Bernstein himself and the London Symphony Orchestra – enjoy! I have been enjoying a LOT of South Asian cuisine as of late. 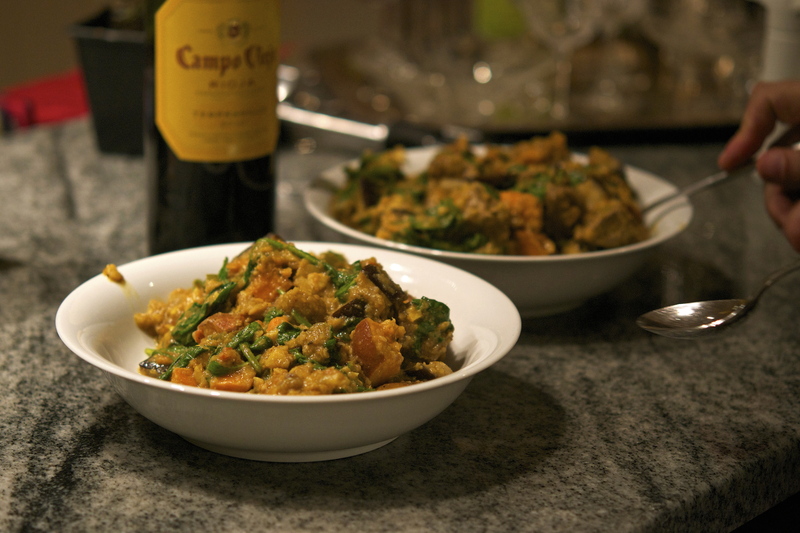 My boyfriend Tom has converted me into a curry-loving/spice-craving gal…granted, he’s got some great recipes up his sleeve (hence the series). In fact, it’s a cuisine that’s perfect for this time of year – winter is not my forte, and Wednesday’s temp was a balmy 7 degrees. The promise of a piping hot meal loaded with spices and protein has been a saving grace during the season. Piling on layers of clothing can do the trick, but this Saag Tofu and Chicken Tikka Masala works wonders on a chilly winter day. 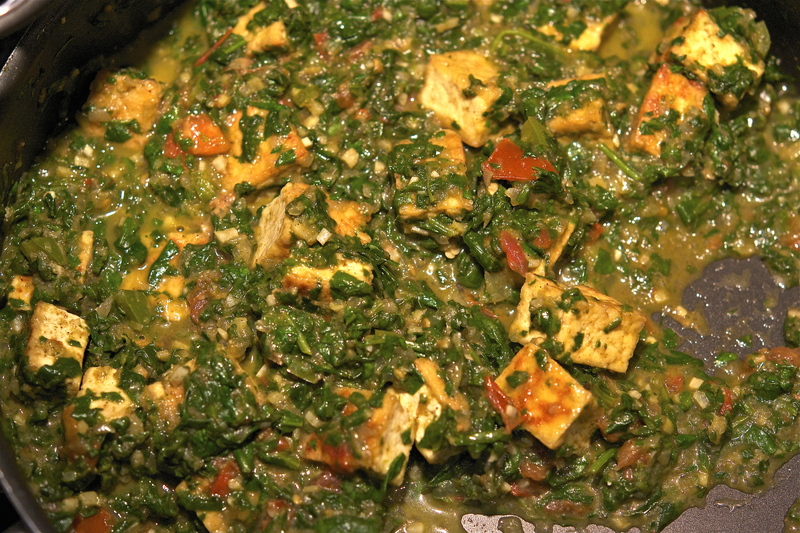 Saag is prominent in Northern India, and is prepared in a variety of ways. The basic recipe is spinach leaves (or similar leafy greens, such as mustard and kale) are finely chopped, then sautéed with a variety of spices. The most well-known rendition calls for pan-seared paneer: a fresh cheese used in a variety of South Asian recipes. 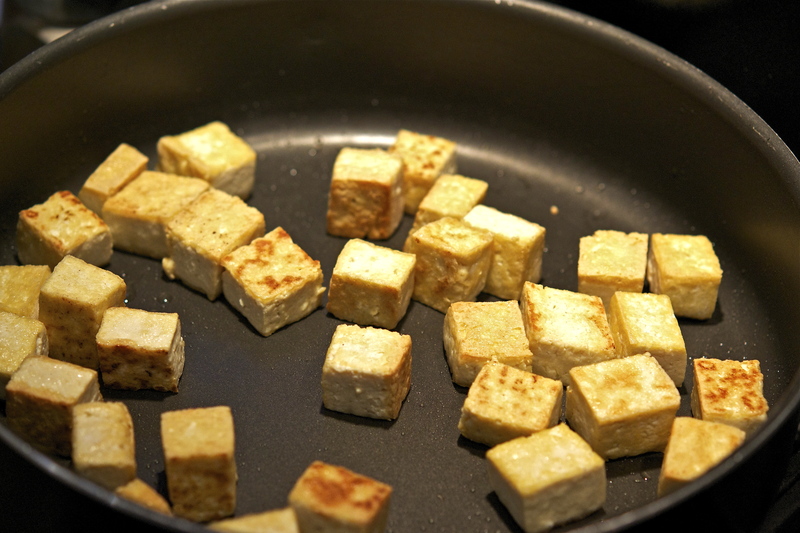 Tom opts for tofu, which is both healthier and easier to find in local grocery stores than paneer. The sautéing takes a bit, but that golden hue gives this dish a texture and taste that’s extraordinary! I have made Saag before, but this is by far my favorite recipe – the flavors are complex, and the textural aesthetic is stunning. Some varieties use cream, yet this recipe is vegan and chock-full of spices: cumin, coriander, fenugreek, and garam masala. The key (per usual with Tom’s recipes) is to dry-roast the spices one at a time, then grind them to a fine powder. It comes together in no time once all of the ingredients have been prepped. Don’t fret if you have leftovers, as it’s even better the next day. Click HERE to see the recipe for this flavorful side! 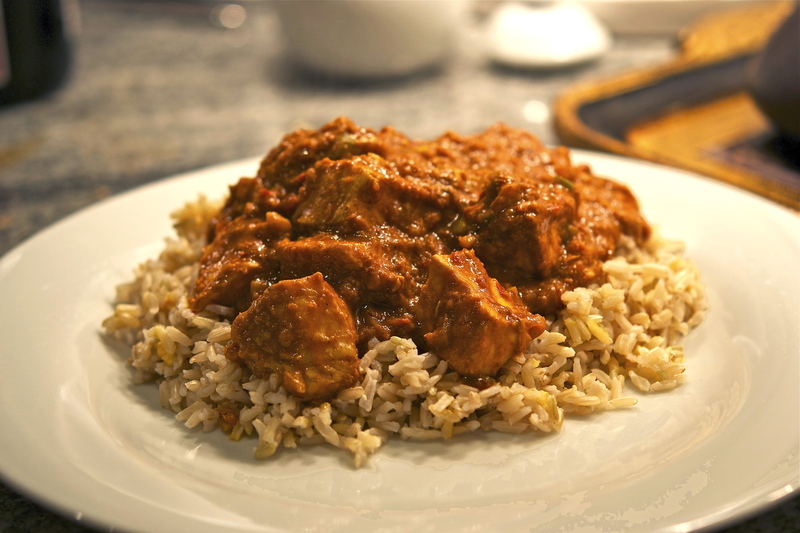 Tikka Masala is one of those dishes that nearly everyone loves – comprised of roasted chicken simmered in a creamy sauce, it is one of Tom’s signatures. 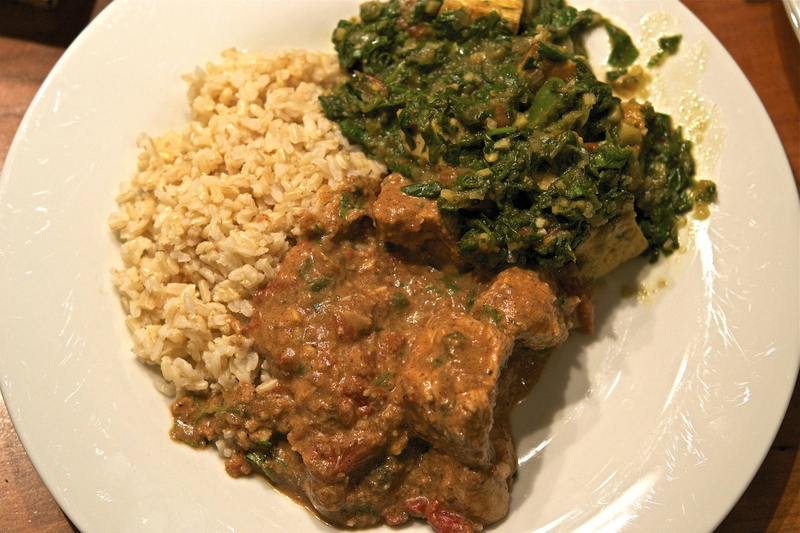 Similar to Saag, cooking the protein separately aids with the texture and flavor of the final dish. The marinade yields a beautifully tender meat that is hard to beat – yogurt is the secret weapon here. 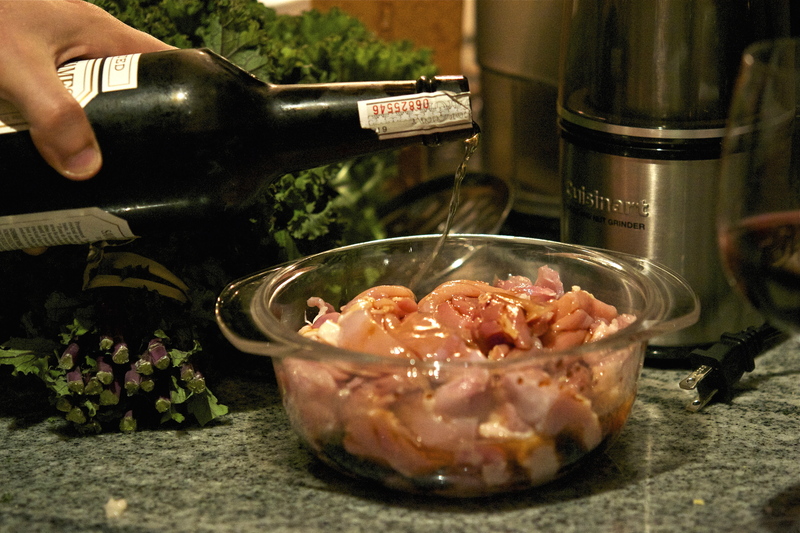 Acidic marinades have been known to “denature” (or toughen) the meat, whereas milk-based marinades won’t. It is alleged that the calcium helps to activate certain enzymes that break down the proteins, creating a more tender and flavorful meat. South Asian and Middle Eastern cultures have been using dairy-based marinades for a looong time, for good reason! The masala, unlike the marinade, is fairly complex – a medley of spices, healthy fats, and vegetables come together to create a creamy sauce that is both spicy and rich. The original calls for a lot of cream, but Tom lessens the cream needed by upping the almonds. 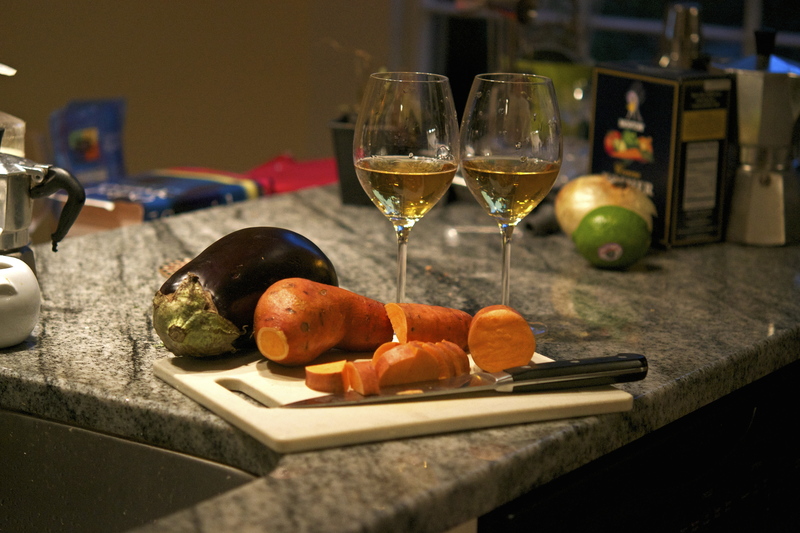 The result gives the sauce more character without inhibiting the spices and aromatics. This dish is both filling and loaded with protein, making it a perfect meal for those colder days. Click HERE to see the recipe for this beloved classic! Winter often gets a bad rap – slushy sidewalks, dry skin, chilly and biting winds – and it’s frozen beauty is often disregarded. 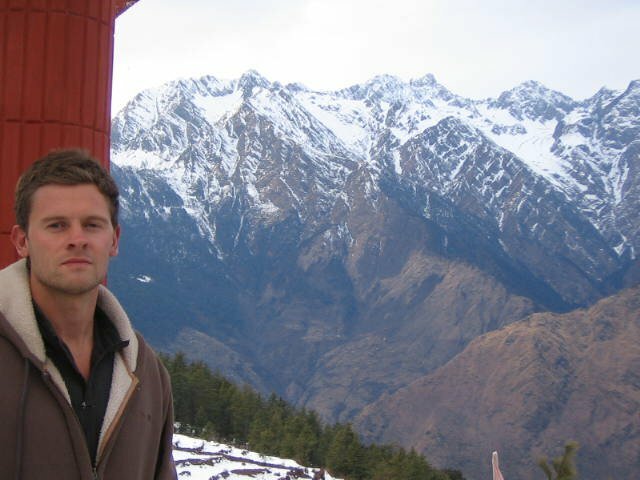 Some of the most gorgeous landscapes I’ve witnessed were in the coldest climates (Tom would readily agree). 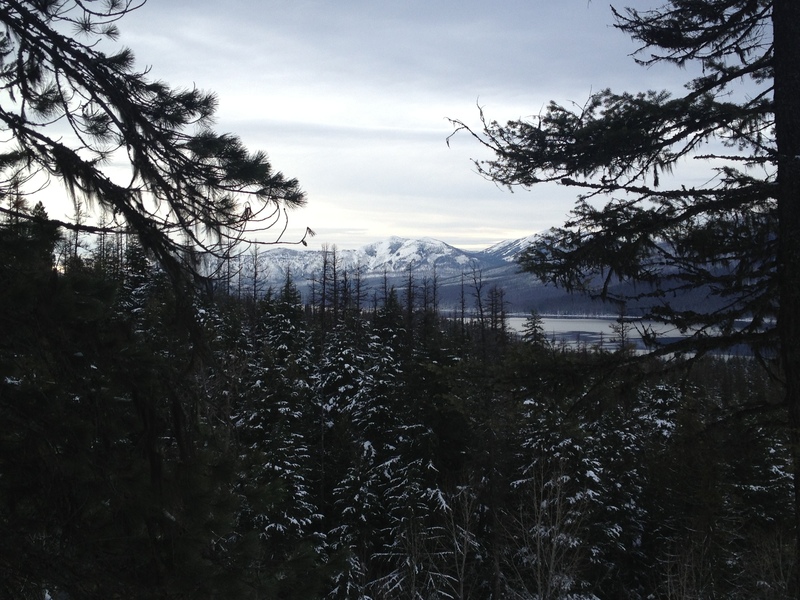 Case in point – the below photo is from a hike we took together in Montana about a year ago. It is one of my favorite pictures to date, and yet I was freezing my tail off the entire time! Spring, summer and fall are often flooded with activity – it is winter that gives us a moment of stillness, in which we may breathe and experience our world. This led me to choose Tchaikovsky’s Symphony No. 1 in G minor, “Winter Dreams.” This symphony is arguably the cheeriest (and least tortured) of his six symphonies. It has a youthful air, which can be attributed to the fact that he was only 26 when he wrote it. In this symphony (just over 40-minutes in length), Tchaikovsky paints the isolated beauty of a Russian “winter journey” using rich orchestration balanced by gossamer melodies. The piece captures the dynamics of this posting’s two dishes, while also alluding to the tranquil enticements of winter. The below recording features Bernard Haitink and the Royal Concertgebouw Orchestra – enjoy!